It's not Michigan week yet, not by a long shot. In fact, we actually have 44 days until football season even begins. But permit me the luxury of breaking out one of the oldest and most often repeated jokes that you typically hear during that week: Directions to Ann Arbor...north till you smell it, west till you step in it. Ann Arbor, the home of the university that we despise, is part of the Detroit-Ann Arbor-Flint statistical area. 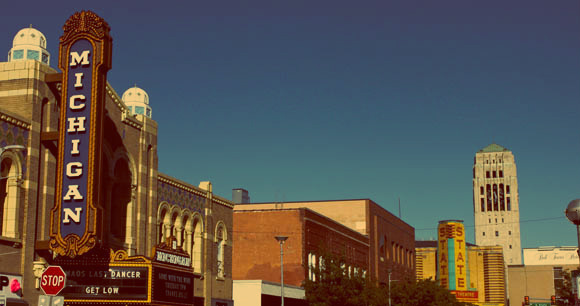 The city proper is actually 35 miles west of Detroit, which means its close enough to partake in the money and culture of the bigger city while still acting superior to it. The university is known for it's research and for its large and loud alumni scattered across the country. The city was founded by a couple of land speculators who supposedly named it after their wives, both of whom were named "Ann". The "Arbor" part referred to the ubiquitous presence of burr oak trees. Only 13 years after the founding, the University of Michigan moved there from Detroit. The city is now defined and dominated by the university. Going up for the game from Columbus can easily be a day trip, as it is only about 3 hours to get there. But if you're planning a raucous celebration after the win, you might want to spend the night. In that case, there are a few interesting attractions in the area that you might want to check out. The university itself has a few notable attractions, one of which is the Gerald R. Ford Presidential Library. Located in the North Campus area on Beal Avenue (close, but missing the silent "e"), the library has over 25,000 pages of documents relating to historical and political topics, much of it centered around the Cold War and Ford's political career. Ford is of course an alumnus of the university and a former football player. The library is only open weekdays, but at least the admission is free. If you have children, or if you are the type that likes to get close to animals, you might enjoy the Domino's Petting Farm. This is a cheap way of entertaining the kiddies and also learning something about farm life if you're so inclined. It was originally part of Domino's Farms (the office park where the national HQ of Domino's Pizza is located) and owned by the giant pizza chain, but they eventually sold it and it now operates as an independent non-profit entity. At the same location, strange as it may seem, is the Ave Maria Fine Art Gallery, the largest art gallery in the state. Speaking of art, if you're into public art displays, you may want to check out The Cube, The Wave Field, The Bookstore Mural, and Graffiti Alley. To get a feel for the campus before the game, walk across The Diag (and make a few disrespectful gestures toward the block "M" at the center), spend some time observing the bell tower, and check out the exhibits at the Natural History building. Architecture buffs will want to visit the Law School Quadrangle. Without a doubt, the most worthwhile attraction in the area (in my mind anyway) is the Henry Ford Museum in nearby Dearborn (just west of Detroit). The museum is on one floor but it covers nine acres and the ceiling is 40 feet high. Inside you will find exhibits covering the gamut from automobiles to planes to anything ever invented in this country. The Greenfield Village on the same site takes you back in time to visit historical homes in a truly authentic setting. 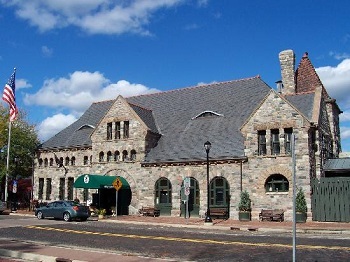 Central Depot, home of the Gandy Dancer restaurant. For those who are on a budget, there are lots of choices of where to eat. To enjoy a good breakfast, check out Angelo's for traditional American fare and Cafe Felix for French style choices. You could also explore Bagel Fragel (Reid?) for a unique take on the traditional starchy fare or Cafe Verde if you're into organic or vegan. For lunch or dinner there are numerous choices. Zingerman's Deli is a popular choice, although it's a bit steep for those on a budget. But they are famous for their unique sandwiches. If you like German food, you'll have your choice between Metzger's and Heidelberg. For middle-eastern, try Jerusalem Garden or Pita Kabob Grill. There are also some good choices for an upscale dinner. The Chop House serves up USDA prime cuts in a sophisticated setting. Roger Monk's has traditional American cuisine in an old historic mansion. Gratzi has contemporary Italian, while The Earle (not Bruce) has French and Italian for those of the more snobbish persuasion. The Gandy Dancer serves up seafood in an old train station called the Central Depot. As for bars, like any college town it has its share. Michigan in general is known for microbrews and Ashley's, with their terrific beer selection, is a great place to try one. Another place with a great selection is Jolly Pumpkin Artisan Ales. The Habitat Lounge at Weber's Inn has live local bands 6 nights a week and features a relaxed atmosphere. Casey's Tavern is a "Cheers" style neighborhood bar with good food and drinks. If live music is all you need, you can't beat The Ark, known around the country for great acoustic performers. If your intent is to catch a few UM fans drowning their sorrows after the loss, some of the places you may want to go after the game are Arbor Brewing Company, The Arena, The Brown Jug, or the 8 Ball Saloon under the Blind Pig. Or you could try any of the establishments in the previous paragraph. Whatever you do, make sure you rub it in with class. We are Buckeyes, after all.